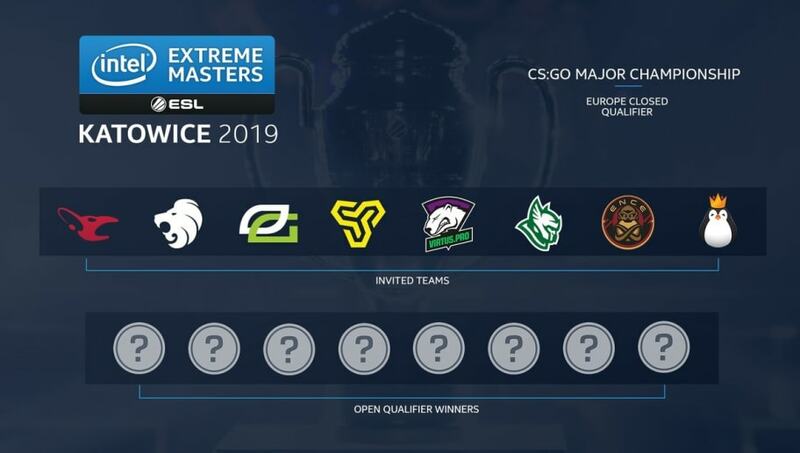 Intel Extreme Masters announced Friday the list of Counter-Strike: Global Offensive teams invited to the IEM Katowice Major's Europe qualifier. The teams competing for their spot in the first ​CS:GO Major of 2019 will include mousesports, North, OpTic Gaming, Space Soldiers, Virtus.pro, Heroic, ENCE eSports and Team Kinguin. As we prepare for qualifiers to begin on October 22nd, here are the invited EU teams to the #IEM Katowice 2019 CS:GO Major Championship qualifiers! They will be joined at the Minor by the winners of open qualifiers in four events around Europe. Registration for the open qualifiers is available now, and the tournaments themselves will take place over the course of October and November. The closed qualifier will take place Dec. 12–13. ESL announced ​IEM Katowice would be the first Major of 2019 on July 12. It will feature a $1 million prize pool and count as a win toward the Intel Grand Slam cycle. While it will share a format with previous Majors such as the FACEIT: London Major, it will be the ​first Major to feature a live crowd during the New Legends Stage.